How am I only just now discovering Askem? I consider myself pretty up-to-date on the latest and best that the internet has to offer, but I have to admit, I'm feeling a little late to this party. The fabulous new app, as seen below, is sort of like Instagram, only more interactive. I'm already completely obsessed. The visual question application allows you to upload pictures, ask your friends questions and find out their opinions instantly, like "should I buy this?" Be sure to check it out below to let me know which look is your favorite! And find out more about Askem here! I love your boots! Your skirt looks amazing on you too :) This is such a cute outfit. Definitely getting this app, I'm so indecisive when shopping. Love this skirt. The pattern is amazing. such a pretty look <3 love the skirt!! Nice look :) this sweater con be combine with everything! How have I never heard of this app before?? What a cool idea! I also love your outfit again (as usual). Especially the print of the skirt! I also love your cute outfit! The skirt & the necklace are my favorites! Hey love how you incorporated the aztec trend in to your look with this skirt and that Chloe and Isabel ring is GORG! I love the print in your skirt and your rings! Omg you are not the only one! I had know idea about the Askem app- trying it out today! Btw you look adorable! Gorgeous! 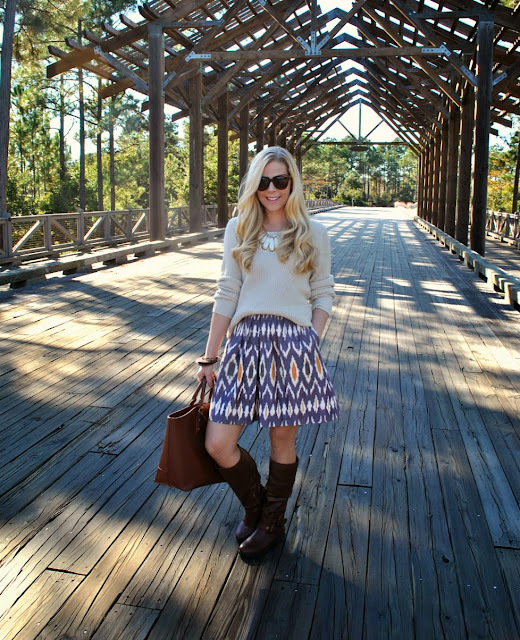 I'm really loving the camel sweater with the skirt's aztec print and color. Great combo! Thanks Anna for letting us know about this APP. Great idea. You look great in this outfit. Love where you are taking your pictures. Gorgeous!!! Love this outfit, that skirt is so pretty..
That sounds like such a cool app! I can't decide what outfit though, they are all so pretty! What a cool app! I didn't know about that either... but totally loving your sparkly nails and that skirt! So fab girl! I love your skirt! And thanks for filling me in on Askem, I too didn´t know about it. Ps, I´ve changed blog name and address. What an awesome app. Thanks for letting me know. And of course, loooove this skirt. LOVE this look and this app. What a great idea. Thanks, Anna. Askem sounds amazing. I can't believe I didn't know about it either. I love finding new apps! 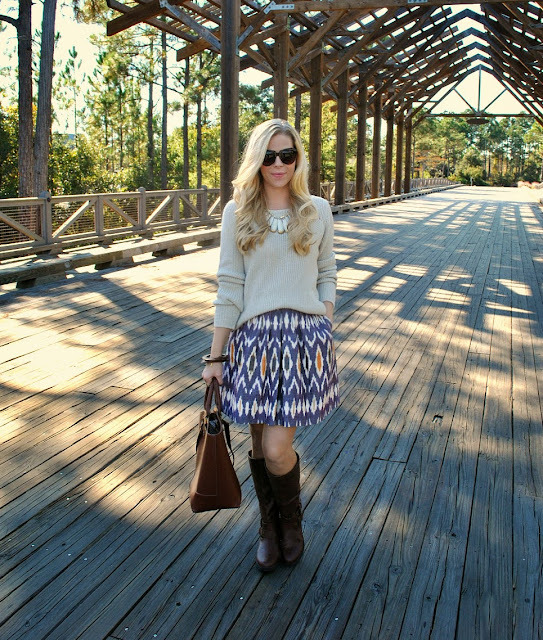 This skirt is so cute with that sweater! I'm loving the print of your skirt! Perfect outfit for the transitional weather! What a great app. Already addicted. Im loving this outfit! it suits you really well dear! Totally getting this app and skirt. It's darling. At least you are way ahead of me discovering the app :) I heard about it from you! This is a cool app! I have never heard of this before. I love your skit in this look, too! First off.. you look adorable.. second... I'm so excited to try this new app! I haven't heard of it either!! Thanks for sharing! Your skirt is so pretty and I am loving the sparkly nails! I love this skirt!!! You can wear it so many ways! I am definitely going to have to try that app out! I love the idea. Also the mix of shapes and proportions in this outfit are perfect. Thanks for the great intro, I need to go download it now! You look so lovely! The skirt is so beautiful! I love the brown ring too! I've never heard of that app. I'll check it out. Thanks for sharing this. I honestly can't decide which is my favorite lol. I love #3 because its so different and you pull it off beautifully. #1 says "I'm freaking adorable, but look out because these are made for walkin" lol and #4 is a hit with me because I love white jeans and brown boots! I've never heard of the app either, sounds great! Loving your skirt in these photos, such an awesome print! Oh wow. What an adorable look, Anna! Your skirt is lovely :)Thanks for the great intro, I need to go download it now! Loving this look! 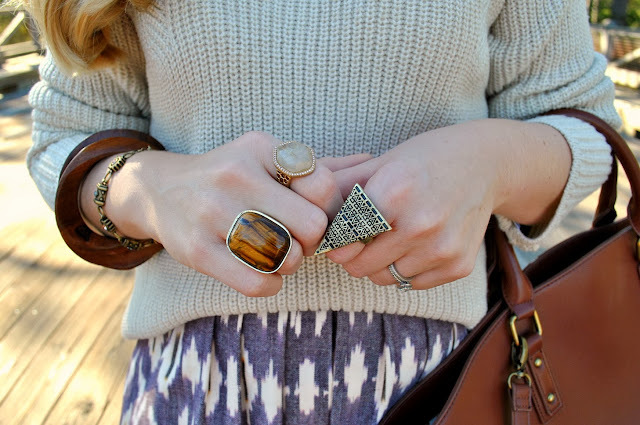 The ikat skirt, big bold rings, and cozy sweater all work so well together. you look so cute! This is a great idea for an app! I am always texting pictures to people asking "what do you think of this sweater/shirt/etc..."
Thank you for sharing, I'll check it out! You look fabulous as always! Come to visit sometimes. I love this skirt, it's seriously gorgeous. Oh my word! You are so cute! Love your outfits!